Emily grew up in Grass Valley, in the foothills of northern California. She earned her bachelor’s degree in psychology at U.C. Davis where she also minored in economics. After graduation, Emily put her economics background to use and moved to Washington D.C to work with a consulting firm that focused on advising government contracting companies on how to improve their business strategy. Emily quickly realized the business world did not allow her to help people on a more personal level. As a result, Emily became a paralegal with a firm that litigated high profile medical malpractice and personal injury cases in Washington DC, Virginia, and Maryland. 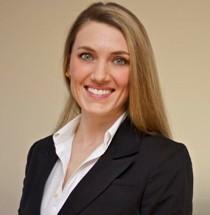 Inspired by her experience as a paralegal, Emily attended Wake Forest school of Law in Winston Salem, North Carolina. There she focused her studies on family law. She found this field of law took a holistic approach to a problem by addressing clients legally, financially, and emotionally. Throughout Emily’s law school career, she participated in the Wake Forest community outreach program by assisting community members with their family law issues. During Emily’s last year in law school she developed her litigation skills through the Wake Forest Litigation Clinic by interning for a family law firm as well as the Forsyth County District Attorney’s Office. Upon graduation, Emily was awarded a family law fellowship through her law school. After enjoying the rich history of the East Coast, Emily returned to her northern California roots to pursue her passion of family law. Since graduation, Emily has been practicing family law in the Roseville and Sacramento area prior to joining Bartholomew and Wasznicky LLP.